Trade-war fears flared up like a bad case of athlete's foot when news hit the market a prominent Chinese tech industrialist had been arrested. The event happened over the weekend but remained a secret until late yesterday; the CFO of Huawei and daughter of the company's founder Meng Whanzou was arrested in Canada on charges of violating sanctions against Iran. Meng is set to be extradited to the US, an event that could turn into a major incident if issues aren't resolved soon. Huawei is a leading manufacturer of phones and deeply connected to global communications which is at the root of the charges. Ironically, her arrest is a glaring example of the issues we face with China. Asian markets were down across the board with losses centered in China. The Heng Seng led with a decline near -2.50% with Japan, Shang Hai, and Korea not far behind. The Meng incident has the entire tech sector moving lower and is not likely over. European markets were down an average -2.5% at the open of the US session and extended those declines to -3.5% by the end of the trading day. The DAX led but the CAC and FTSE were not far behind, trade concerns were the primary cause. Today's economic calendar is full due to yesterday's market closure. 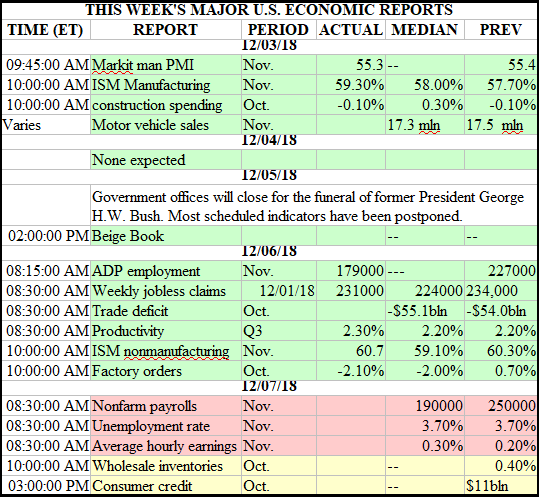 Starting with the Challenger report on planned layoffs things are still looking good although there is some concern an uptick in layoffs this year could be an indication of an economic downturn. 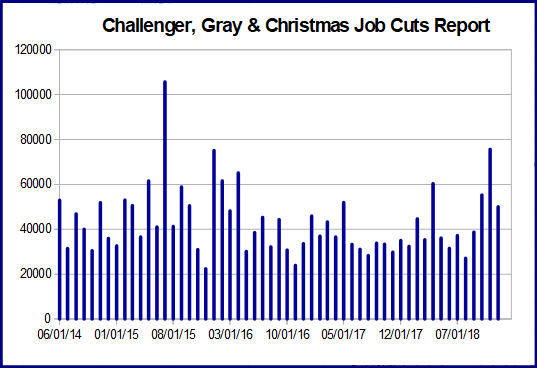 Challenger says average layoffs have run higher this year than last and accelerated in the last three months which signals something is happening but I don't think it is going to be an economic downturn. The number of planned layoffs fell -29.8% in the last month to 50,073. GM is responsible for 14,000 or 28% of that total having announced a 15% cut to its labor force. On a year over year basis job cuts are up 51.5% this month versus the same month last year, on a year to date basis cuts are up 28%. On the hiring side, Challenger says hiring is on pace for the second strongest year of hiring ever, down only slightly from last year. Initial jobless claims fell -4,000 to 231,000, with last week's revisions the decline is closer to -3,000. The four-week moving average of claims rose 4,250 to 228,000 but remains low relative to the long-term trend. On a not adjusted basis claims jumped 44% versus an expected 46.5% in the last week, not adjusted claims are down -3% versus the comparable week last year. This week's data isn't too exciting but is consistent with labor market health with no sign of major economic reversals that I can see. Continuing claims fell a remarkable -74,000 to hit 1.631 million. This monstrous decline is on top of a downward revision, -5,000, and puts the number of second-week claims a hair above the long-term 45-year low. 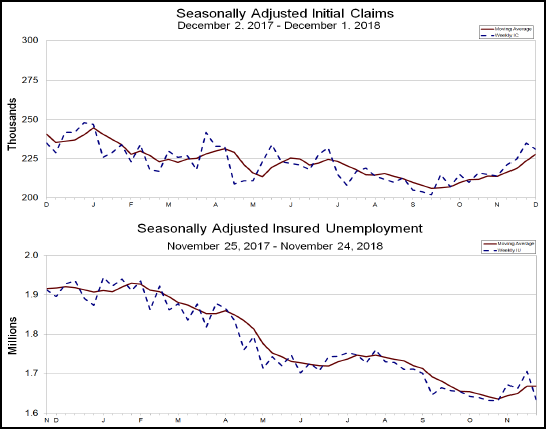 The four-week moving average of continuing claims rose slightly but remains low relative to the long-term trend and at levels consistent with a healthy labor market. The total number of claims fell -10,000 to hit 1.462 million. 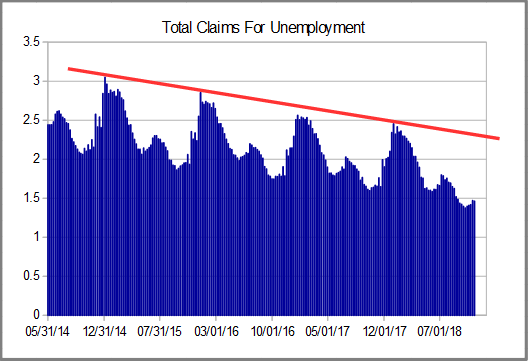 The number of claims is in a seasonally expected upswing so I do not expect to see it continue to hold steady at this level much longer. Looking at the chart I expect to see total claims peak out near 2.25 million sometime in early January. The total claims figure is -11.2% below last year's figure and has been trending in a range between -10% and -20% all year. So long as we don't see total claims peak higher than expected, peak longer than expected, and/or move on to set a higher low than the corresponding low last year the economy should be in good shape. 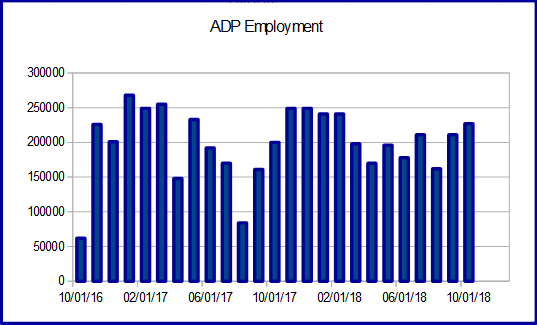 ADP says the number of newly created jobs in America rose by 179,000 in November. The is down 46,000 from the previous month but in line with the long-term trend and expectations. The previous two months were both revised lower but the losses were marginal. Job gains were centered in the mid-sized businesses and services. Construction had 10,000 new jobs added while professional services, health, and hospitality accounted for 130,000. No sign of economic slowdown here, this data is consistent with job creation and labor market health. Productivity increased by 2.3% and more than expected in the third quarter. Output increased 4.1% while hours worked increased only 1.8%. On a year over year basis, productivity is up 1.3%. 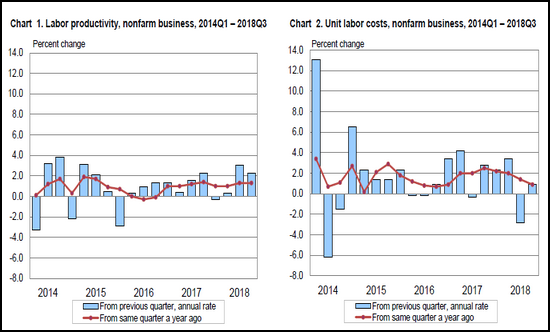 Labor costs rose a moderate 0.9% and in line with expectations. Wages increased at a 3.1% rate (same as indicated by the NFP) which is slightly faster than the 2.3% increase in productivity. No sign of economic downturn here, this data is consistent with a healthy consumer and productive businesses. The Dollar Index fell in today's session as US bond yields continue to come under pressure. The bond yields are falling in response to several issues including Powell's newly minted dovish stance, trade concerns, and fear of slowing growth. These all add up to a weaker dollar although the data still suggest strength within the economy. Today's action created a medium sized red candle moving down to support at the short-term moving average. The candle is to the side of the previous candle and within tight and narrowing trading range focused on (possibly) a round of central bank meetings that begin next week. 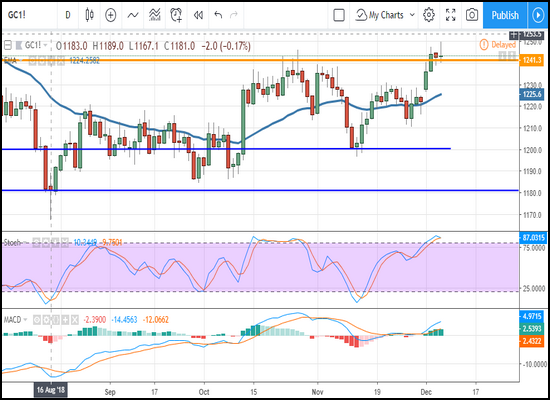 Gold prices moved up to set a new 5-month high and are consolidating above resistance in a way that may lead to higher prices. The indicators are bullish and confirm rising prices but there are some caveats. The first is that momentum is still weak, the second is that stochastic is becoming overbought while the index trades at the high end of a trading range, and all ahead of key economic policy events. A move up may go to $1,260, a fall below $1,240 would be consistent with range-bound trading and may take the metal down to $1,220 or lower. 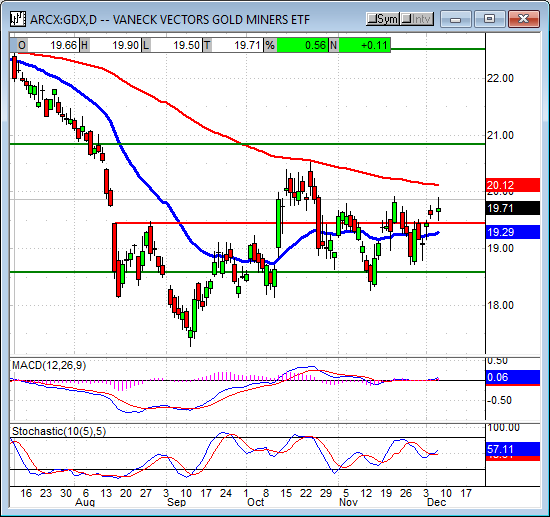 The Gold Miners ETF GDX also moved up to set a new high and is also still trapped within a trading range. The difference is that ETF only set a two week high and its trading range is more pronounced. Today's candle is red with a visible upper shadow which is indicative of resistance at the $20 level and the top of the four-month trading range. The indicators are both consistent with range-bound trading and, more so, a market that is at rest or near equilibrium. 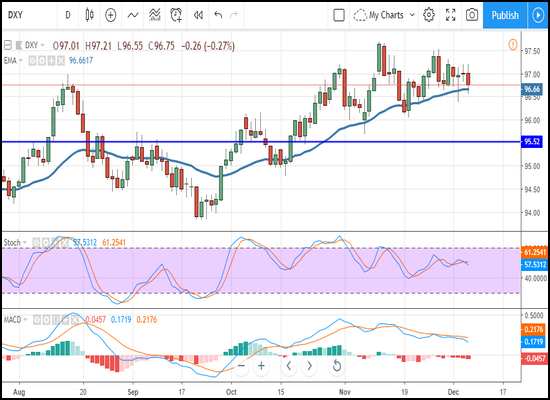 With this in mind, the index is ripe for a larger move, the only question is what will spark it or, better, what will spark gold to move out of its range? Oil prices fell hard on news OPEC was considering a smaller cut to its production than the market had hoped. 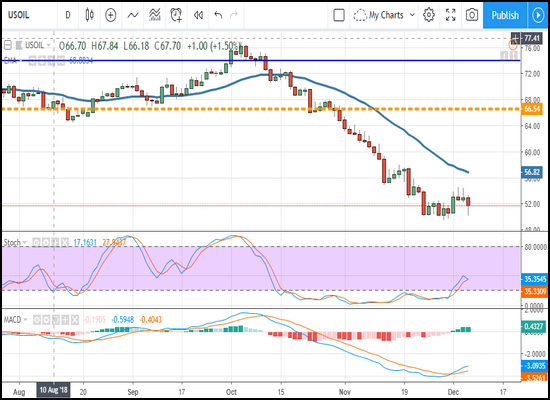 The news was not confirmed, OPEC has yet to offer an official statement, and prices for black gold rebound later in the day. WTI fell more than -4.0% in early trading but regained a large portion of those gains before settlement time. Prices were also supported by a surprise drawdown in crude stockpiles. WTI stockpiles fell more than -7 million barrels in the last week, analysts had been expecting a figure closer to -1.0 million. The drawdown was offset by larger than expected builds in both distillates and gasoline but neither come close to covering the 6 million barrel difference between today's report and the expectations. WTI is still above support at $50. The Oil Index fell more than -3.0% in today's action, most of which occurred before the start of the session. 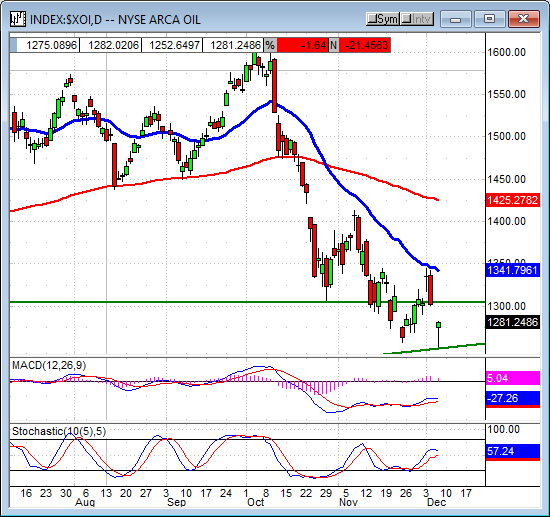 The index opened a gap, created a small-bodied candle and is showing support exists at the 1,250 level and November's lows. Today's support is also coincident with a long-term uptrend line which gives it a bit of added strength. A move lower, below 1,250, with a close below the uptrend line, would be bearish and may lead to another major decline in oil stocks. 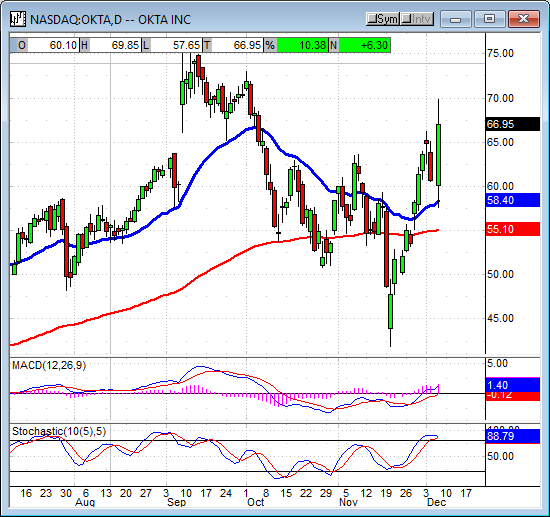 Okta, an identity management software firm, reported earnings before the bell. The company says earnings and revenue are better than expected and raised its full-year guidance. Revenue jumped 58% over the same quarter last year as Internet users become more and more aware of the dangers of web-surfing. Shares experienced a wild day of trading but were able to close higher with gains near 10%. The $70 level presented some resistance but the indications are good that resistance will be tested again if not exceeded. 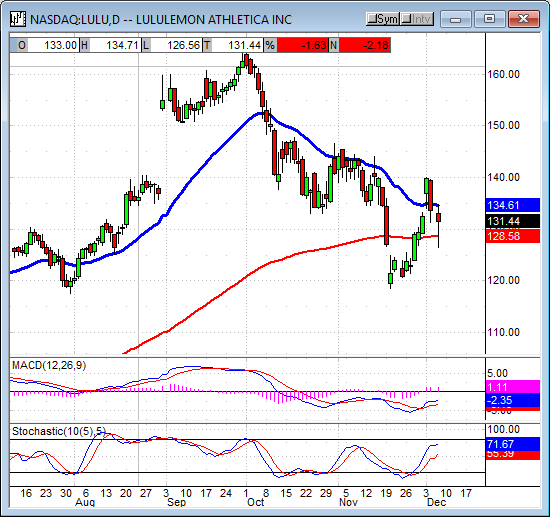 Lululemon reported earnings after the bell. The company says revenue grew 20.8% over the last year, the EPS was better than expected but fell on weaker than expected guidance. The company says comp store sales may reach low double digits in the next year which sounds pretty good to me. Investors had been expecting more, shares fell -5% after hours. 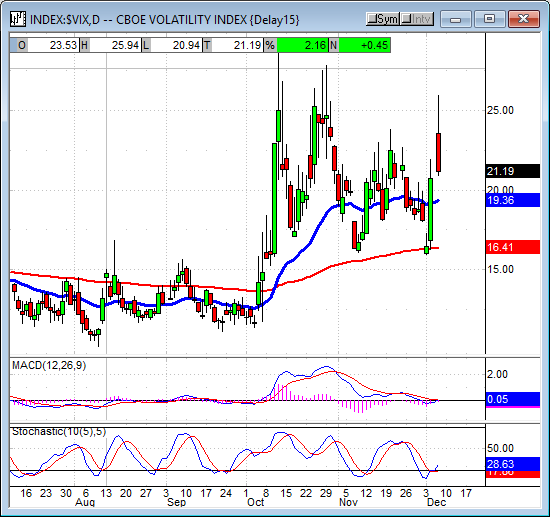 The VIX shot higher in today's session but is signaling the top of a range. The fear index opened with a gain near 12%, extended that to near 20%, and then fell in late day trading to form a possible shooting start and abandoned baby formation. 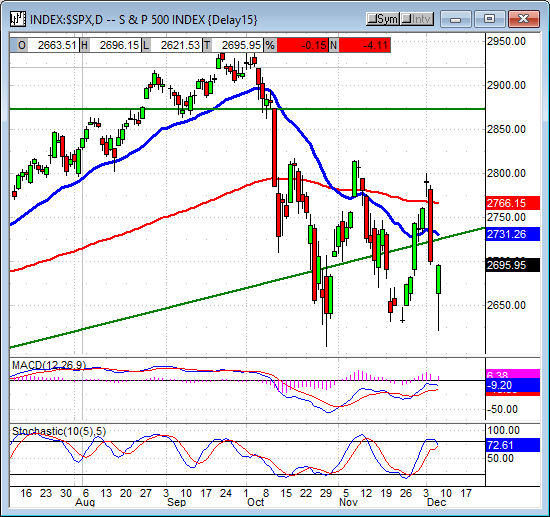 This candle is showing resistance at the 25 level, resistance that is consistent with bottoming in the broader S&P 500. The indicators have rolled into a bullish signal so upward movement in fear may still come. If not, and this is how I'm leaning, the VIX could easily fall back to 20.00 or 15.00 in the next few trading days. The indices. The indices experienced a little bit of indecision in today's market after falling to new lows. The lows were driven by fear, legitimate fear, but fear nonetheless and the mass sell-off that began in the early hours of this morning hit support right where it was supposed to be. Support resulted in a bounce, the bounce resulted in a rally, and the indices regain most if not all of their losses today. The leader is the NASDAQ Composite. The tech-heavy index shed more than -2.0% in early trading only to bounce back and close with a small gain. 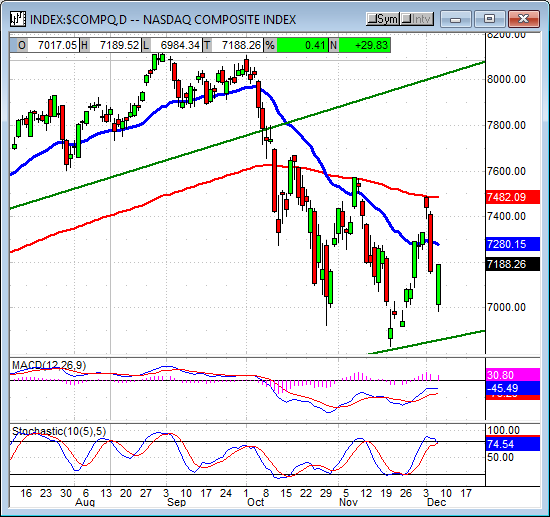 The index created a long green candle in the process and is confirming support at the 7,000 level. This support is consistent with bottoming action that has been going on over the past few months and is bullish. The indicators are bullish and consistent with rising prices so a move up from these levels is expected. A move up may meet resistance at 7,300 and 7,500. 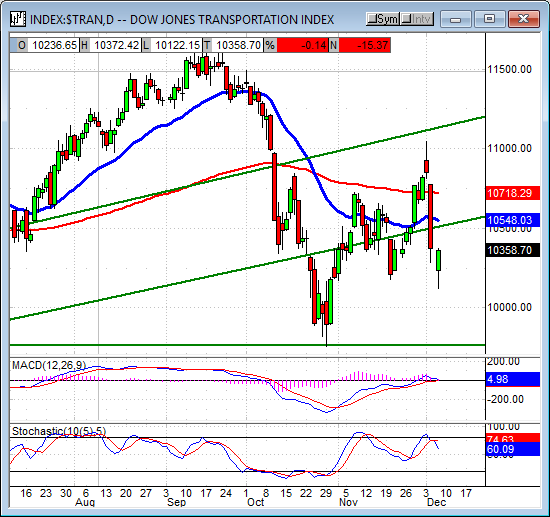 The Dow Jones Transportation Average posted the smallest decline with a loss of only -0.10%. The transports created a medium-sized green candle that confirms support at 10,200 and may lead to a bounce higher. The indicators are mixed, rolling over into bearish crossovers but otherwise consistent with range-bound trading, so they aren't much help on their own. With the index sitting on and confirming support though, the indicators look set to fire a bullish signal with upward movement of index prices. A move up may find resistance at 10,500 or 10,700. The S&P 500 posted the second smallest decline with a loss of -0.17%. The broad market index created a large green candle with a long lower shadow that is indicative of support at these levels. The candle is confirming the 2,650 level which is also consistent with bottoming action that has been going on the past two months. The indicators are bullish but reflect the presence of sellers so caution is still due, volatility is not yet gone, but a move higher is expected. A move up may find resistance at 2,730 or 2,800. If the index moves lower my target for key support is near 2,625. The Dow Jones Industrial Average closed with the biggest loss but still only -0.30% after being down -2.0% and more earlier in the day. The index formed a large candle but with a medium sized body and long lower shadow. This candle, particularly in light of today's placement, is indicative sellers made a strong push to new lows but were overcome by buyers. Along with that, the candle confirms support at a key uptrend line that has been in play for years. 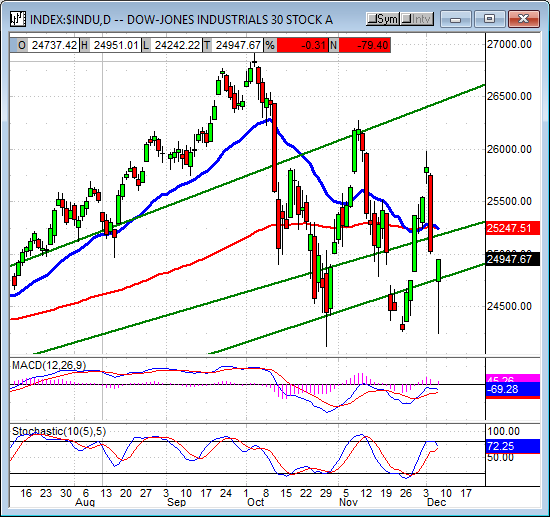 The indicators are a little shaky looking but otherwise bullish so a move up from this level is expected. Resistance is likely at 25,250 and then above 25,000. Today's action was bearish, the market was selling off hard on trade news and whatever other reason it could think of, and then it wasn't. The market made a miraculous turnaround just when it was surpassing November's low and reclaimed all of the day's losses. The move is bullish but may have been caused by algorithmic trading so caution is still the name of the game. Today's rally may also have been caused by word the FOMC was considering a pause after hiking rates this month so caution is still the name of the game. Trade, trade tensions, China's reaction to our arresting one of theirs, data, and FOMC are going to drive volatility in the market the next few weeks but I remain bullish for the long-term. 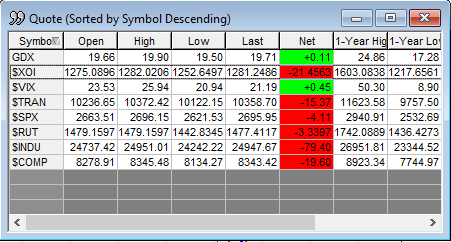 In the near-term, well, it looks like the market wants to move higher but it's having a hard time. I am bullish for the near-term but very cautiously.